The new single from their third album, Heart On, which comes out on October 28, 2008. If you’re not familiar with them (you should be! 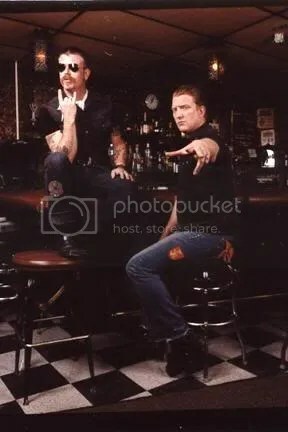 ), the core of EoDM is Josh Homme (Kyuss/QOTSA) and Jesse Hughes. Homme rocks the drums and Hughes does vocals and guitar duty. They are a lot of fun and they know how to rock without getting too serious and overblown about it. Great stuff, I can’t wait for the new album. This entry was posted on October 9, 2008 at 12:00 pm and filed under TheSlacker. You can follow any responses to this entry through the RSS feed.